This news may come harder for we women who, more often than men, generally make a sport of this. While complexity and familiarity of tasks play a part, overall this start/stop/start process is rough on us. There is evidence that it can eventually squelch overall concentration and creativity even when engaged in single tasks. One solution is the twenty-minute rule which recommends engaging in a single activity for at least twenty minutes before moving to another. Result: brain health. As Seven Sisters we practice and live the sixty-minute solution! Wow, consider the brain and soul health we experience! While each of us carries life’s challenges and burdens, let us be reminded that our only charge for our Seven Sister Hour is to pray for one person. Single tasking at its best! What a perspective to realize this is a gift in itself: to be drawn from the distractions of the day, the week, to engage in what de Caussade reminds is the “duty of the present moment”. We are not insensitive to the other concerns and demands of our day or lives, but rather responding fully to a heavenly task to which we have been assigned. In the long run we are benefitting from the disciplined practice. Another hidden gain of this Apostolate! De Caussade believes that the one given over to God in the moment is a “soul as light as a feather, liquid as water, simple as a child, active as a ball in receiving and following the inspirations of grace. … they have confidence in Him, they abandon themselves to Him, and, entirely absorbed by their duty, they think not of themselves, nor of what may be necessary for them, nor of how to obtain it.” Oh, what blessings this affords! 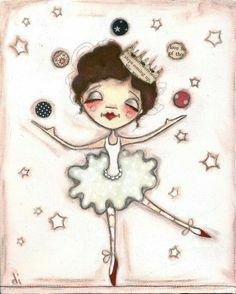 Reality check: at times the single task focus proves challenging to lay aside (even momentarily) the many things we balance and manage, as both whimsically and somberly depicted by Duda’s Princess Juggler. While it might be tempting, or even seem necessary, to carry all that we juggle into our Hour, trust that the grace is sufficient to discipline that time as we have committed it: one hour for one. If personal concerns overwhelm, perhaps another can cover your Hour that week or perhaps extra time in prayer in the Chapel can be spent prior to or following your Hour. The April 2016 Communiqué offered helpful hints to help curb distractions. It might be worth a re-visit on the Web. Related ones are July 2017 (benefits of being before the Blessed Sacrament) and Nov 2017 (de Caussade regarding submitting to Divine Will). On the Web site, simply click on any of the Communiqué images to open and then scroll to the bottom of the screen to select an archived Communiqué. Just for fun – and to perhaps ‘prove a point” regarding multitasking: try this simple exercise. Time this: Draw two lines. On one write: “I am a great multitasker.” On the other write all numbers 1 through 20. Note time. Re-set watch. Draw two more lines. Write the same things on each line as before BUT only one character/number at a time. So, on the first line write an “I”, then switch to the second line and write a “1”. Then go back to line one and write an “a”, then to second line and write a “2”. Complete the exercise filling the two lines with the same info. Hmmmm – how long did it take you the second time? Any mistakes? I rest my case! Our every effort to keep our Hours focused upon one reaps benefit. Let us embrace the grace upon grace to be keenly aware of the present moment – at every moment! How beautifully St Augustine reminds us that our Ever-Present Help is Ever-Near to assist. “You never go away from us, yet we have difficulty in returning to You. Come, Lord, stir us up and call us back. Kindle and seize us. Be our fire and our sweetness. Let us love” (St Augustine). Oh, truly, Sisters, in our call to love, we live the richest lives! UPDATE on SEVEN SISTERS PILGRIMAGE to FRANCE (July 1-12, 2019): Fr Joseph Johnson, Apostolate Chaplain, has prayerfully discerned and worked with his travel agency, Peter’s Way Tours, to offer a first-of-its-kind-one-of-a-kind pilgrimage for Seven Sisters. It is a whopping 12 days! (This will be my first pilgrimage of such a length). It is all-inclusive, full of rich detail. Click here for more information. Prayerfully consider this journey of a pilgrim’s progress in faith, hope and love. Open to all Seven Sisters. Only one bus is planned, so indicate early your desire to join. Come to meet the priest whose generous and joyful example of living out his priesthood sparked the International movement of Seven Sisters Apostolate. Heartfelt welcome: New groups registered in January in these states: Arizona, Colorado, Illinois, Indiana, Iowa, Kansas, Maryland, Minnesota, Missouri, Montana, Nebraska, North Dakota, Pennsylvania, South Dakota, Virginia, Washington, and Wisconsin. These 11 states in the USA do not YET have the joy and benefit of a Seven Sisters group: Alaska, Hawaii, Idaho, Maine, Nevada, Oklahoma, Oregon, Rhode Island, Utah, Vermont, Wyoming. (Have received inquiries from three of these though – please join in prayer!) Total groups: very, very near to 800! Perhaps as a grand gift to the Sacred Heart of Jesus we will reach 1000 by our June commitment month! SEVEN SISTERS Tri-fold BROCHURE: So beautifully designed by a Seven Sister, Diane S, of Wichita, Kansas. They can be effectively used in parish pamphlet stands (ask your pastor’s approval prior), Adoration Chapels, Retreat Centers, Bags/Packets for Women’s Conferences/Retreats, Women’s clubs, Serra club. There is a full color version and one with a color exterior and B/W interior (my personal favorite and a bit cheaper to print). Available as free download. Recommend 80# silk for best printing results. You may also order through sending an email through the Web. Pricing varies with quantity. May God bless Diane, for this labor of love and generous spirit to share it! > Plans for Georgia and North Dakota visit in the prayer stages. MASS as substitute for the HOLY HOUR: While Mass is arguably the highest form of prayer, it is not the form of prayer given in the inspiration of this Apostolate. We do best to stay close to the inspiration, submitting always to God’s Will and Way. Importantly, every Holy Hour is intimately tied to holy Mass, as our Jesu Hostia must be confected during the Mass. Some other thoughts: Each Mass has an intention, which, whether known or unknown, we are to offer this as participants of a Mass. In the Confiteor, we ask for prayers for ourselves and others ask our prayers for them. The Prayers of the Faithful are offered for many intentions. Embedded in the Eucharistic prayers are solicitations for prayers for the Pope, Bishops, priests and both the living and the dead. One can easily see then that the Mass has many intentions and not solely the one priest for whom one is committed to pray. Offering your Holy Communion at a Mass for the priest would certainly benefit the priest, but would not serve as a substitute for your Holy Hour. Especially when access to a Church or Chapel is limited, some Seven Sisters keep fidelity to their Hour by arriving early for a Mass on ‘their day” and beginning the Holy Hour for their priest. Then they attend the Mass and then pray the balance of the Holy Hour for the priest after the Mass. In his book, Those Mysterious Priests, Archbishop Sheen states that a Mass never interrupts a Holy Hour. SPANISH translation of Communique: This is generously done every month by Zahyra B, Anchoress for a Seven Sisters group in Venezuela. EXTRA PRAYERS for VENEZUELA! They are then posted (and archived) on the Website. If it is easier to receive through an email account, please let me know. Expect 2-3 days for translation. Commitment Prayer is also in Spanish (on the Web).